Both Renault Sport and VW have claimed the hot hatch top spot in the past - where do they stand now? 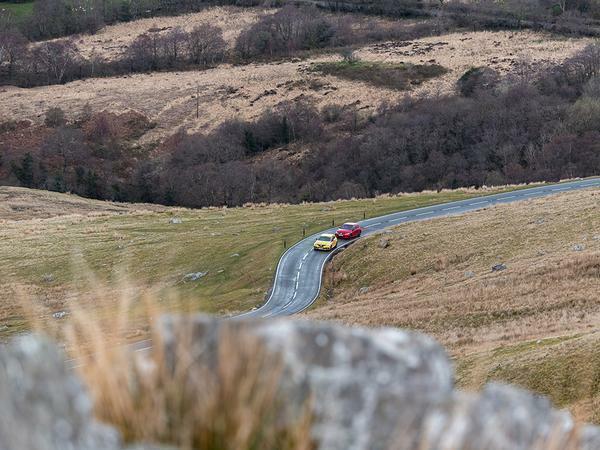 Despite occupying very similar positions in the market, the respective routes taken by the Megane Trophy and Golf TCR could hardly be more different. 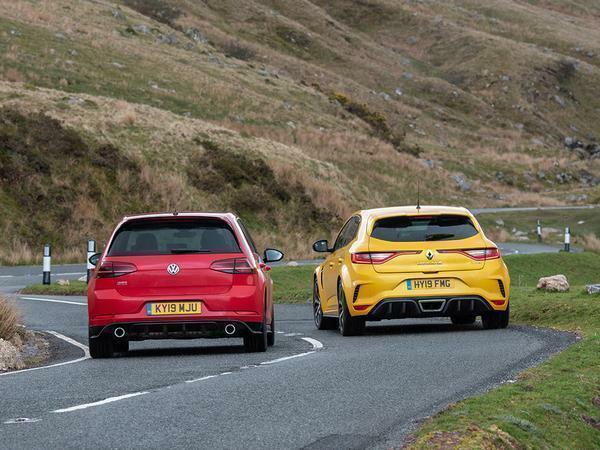 The Renault comes into this test with something to prove, a small Trophy raft of nipping and tucking arriving much sooner in the lifecycle than last time around, presumably after some less than glowing reports for the Megane 280. 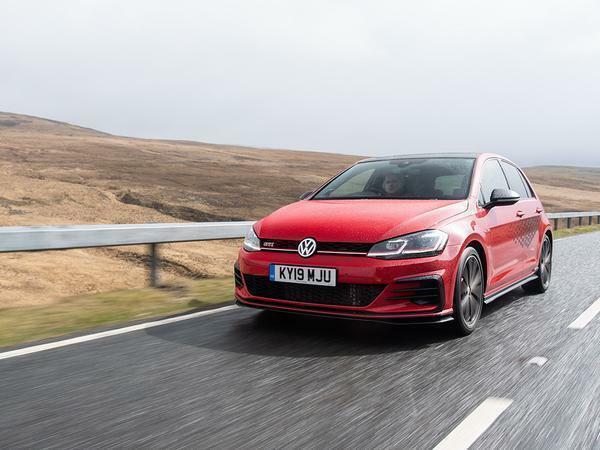 The Golf, on the other hand, is very much in the autumn of its life, seemingly here to remind all around that it's still the consummate hot hatch package. Just as it was on launch in 2013, just as it has remained ever since. 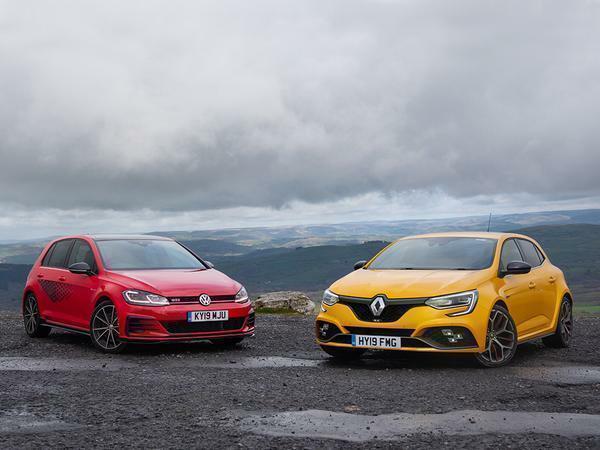 Both, though, represent a concerted shift to a more focussed brand of hot hatch. 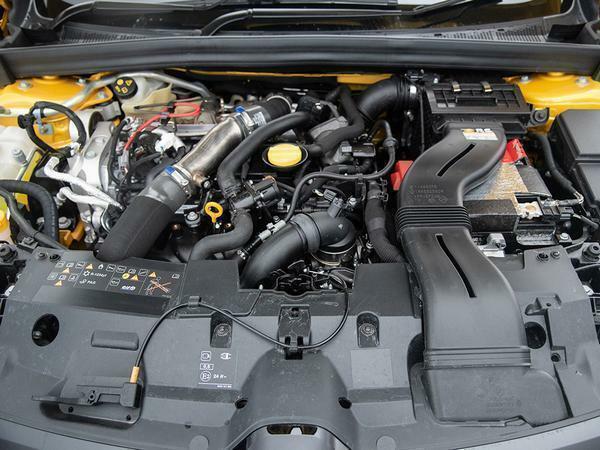 It was the commercial success of (very) fast Golfs that forced Renault Sport to gently rethink its approach to the segment, resulting in something more accommodating and a little less feral. It's fair to say that the resulting Megane hasn't proved universally popular - but it's also worth reviewing just how crucial the Trophy badge has been in the past: the Clio of 2005 was stupendous; the last generation Megane arguably even more so; and while the tweaked version of the current Clio could not fix all its ills, it was a significant improvement on what came before. The TCR makes the motorsport connection even more explicit, and is boosted to within 20hp of a Clubsport S to emphasise the point. You can't have a manual 'box - but you do get a choice of five- and three-doors (which you don't in the Megane) and you do get the pleasure of owning what will almost certainly be the run-out version of the Mk7. And the all-encompassing talent of that model has been reiterated umpteen times over a two life cycles. A longstanding familiarity with it means it's the Renault first up when Wales hoves into view. The Megane's reputation as a challenging car to get a wholly satisfying grip on is probably deserved, but, make no mistake, parts of the car are genuinely class-leading and the more rigorous version does nothing to dispel the notion that there are geniuses of all sorts hidden away in Dieppe. The way the Trophy rides, the exemplary way in which it deals with bumps, its flawless composure and incredible resolve, must be experienced to be believed. At speed, it simply laps up any punishment thrown at it, those hydraulic bump stops proving their worth even when every internal instinct tells you that an oncoming combination of bump, camber and surface ought to upset it - only to find the car gliding through again. 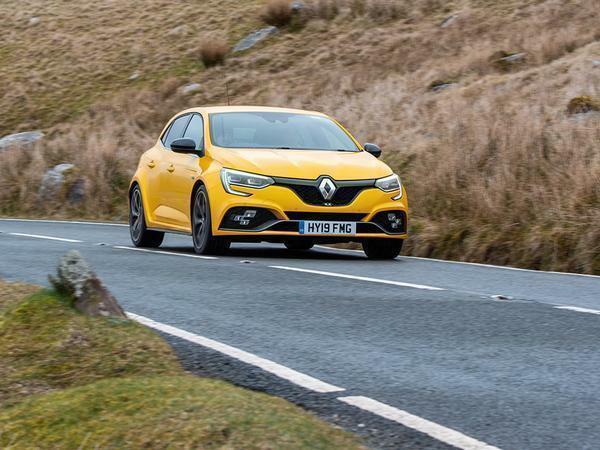 The Megane isn't aloof, either, floating over surfaces and distancing the driver; it just works, with that rare combination of plushness, authority and dexterity that Renault Sport seems to do better than any other manufacturer in its price bracket. 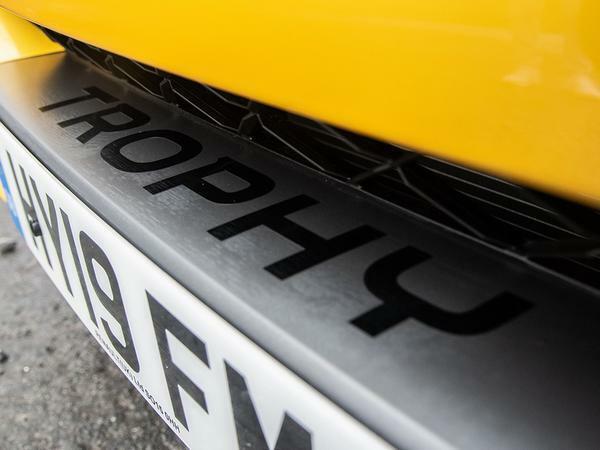 Oh sure, the Trophy is firm around town - something that will compromise its credentials as a more usable fast Megane - but the quality at high speed seems more than worth the pay off. 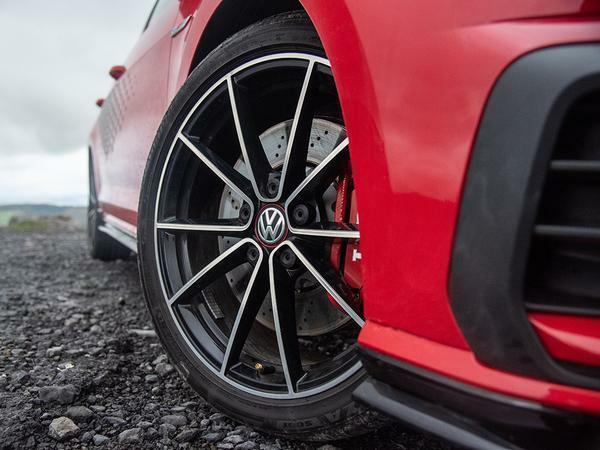 The Megane has fantastic brake pedal feel and performance, too, (the bi-material Brembo discs, optional on the Cup and standard here, must be helping) sufficiently so to make the Golf feel more overservoed and artificial than usual. The mechanical limited-slip differential and PerfoHub - the latter suspension axis tech having helped Meganes for a decade now - give the Trophy a more precise, more direct and less flustered front end than the TCR, the car turning with greater conviction and delivering better traction, in spite of both being somewhat hampered by Bridgestone Potenzas. 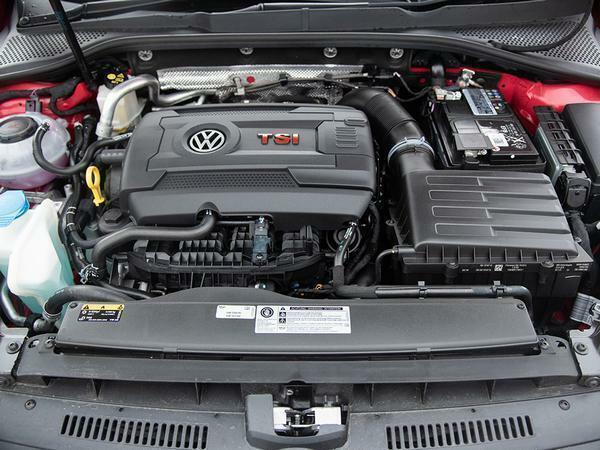 By comparison the Golf suffers in greasy conditions where the VAQ cars always have - that split second before the system reacts undermines confidence, where a more proactive mechanical unit encourages the throttle to be chased. That the Renault's steering relays a clearer picture of what the front tyres are doing when they're being pushed only helps its cause further. The problem? It still feels compromised, the Megane - especially when you measure it against the high bar of its maker's legendary back catalogue. It'll sound like rose-tinted nostalgia, but previous Trophy-badged models felt fantastic in a way that spoke to harmony achieved in their tuning. The feedback and handling balance - both of a fizzing, challenging sort - were key components in a transparent, traditional sense of fun that ultimately eludes the current car. While the four-wheel steer feels less forced than it first did in a 280 Cup, in the Trophy there's still a sense of chassis agility and steering response not being entirely in sync with your intentions. Oddly again given this Megane's remit as a more accommodating hot hatch, the 4WS makes the most sense being driven hard in the Race mode, where you learn to trust the directness and incisiveness a little more. But never being entirely sure of the car's reaction isn't exactly a positive. Elsewhere the manual gearbox is lovely to have, yet hardly shines on the Brecons thanks to a slightly notchy shift and overly large knob (insert age appropriate joke here). Throw in an awkward driving position (where the seat goes low enough but the wheel not out far enough) and that impression of a slightly disjointed car only pervades further. They don't diminish the highlights, because when the Trophy is good, it is exceptionally good. But failing to paper over its shortcomings - some of them inherited from stock, family-focussed Megane - is conspicuous because the last generation model accomplished it by endlessly harmonising with the expectations of those who bought it. To make matters worse, the Renault's mixed bag is made to seem virtually deconstructed by a car that gels its dynamic elements into such a slick and stylish whole that it ought to wear a Brylcreem logo. 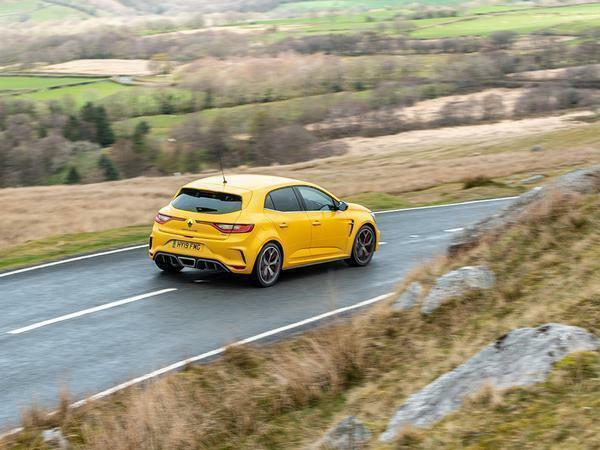 It just works, to a very high bar, immediately; there's no familiarisation period, no need to attune your driving and it makes for an easygoing, easy-access hot hatch package that's jarringly distinct from the Megane. 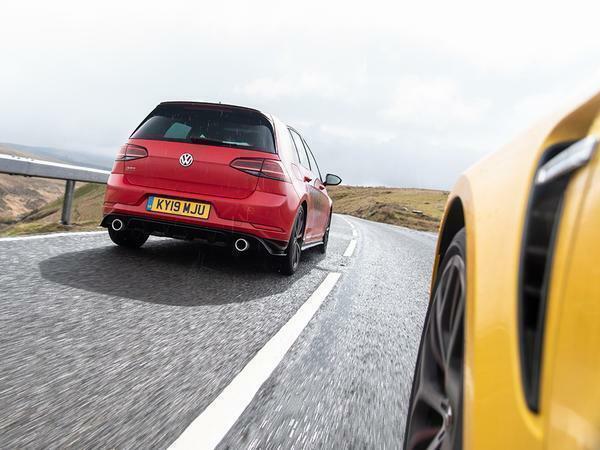 Only at the very limits - typically the same stage where the Megane feels at is best - does the Golf seem flummoxed for those last few percentage point of finesse that the very best manage (and which we've seen, it should be said, in the Clubsport S). Otherwise it's the all-things-to-all-people hot hatch: fast, responsive, appropriately engaging, more than capable enough and really rather pleasant company - in almost all circumstances. Does a TCR feel markedly different from a Golf GTI Performance? It's a negligible change, really, a bit quicker without being dramatically so and broadly the same to drive. Not a bad thing, because that's a damn fine car, though it does seem something of a shame that the car supposedly lent motorsport credence in the GTI range doesn't offer something a little more... engaging. There are other areas where the Golf could be seen as coming up short in this comparison, too. The driving position perches you higher than in the Megane's Recaros, the engine note is plainer and less interesting, and the TCR overhaul hasn't made the Golf any more thrilling to look at. Perhaps not a vital concern for a Golf GTI, but arguably something badged 'Touring Car Racing' should excite a little more. The Megane, to these eyes, is much more interesting to look at. 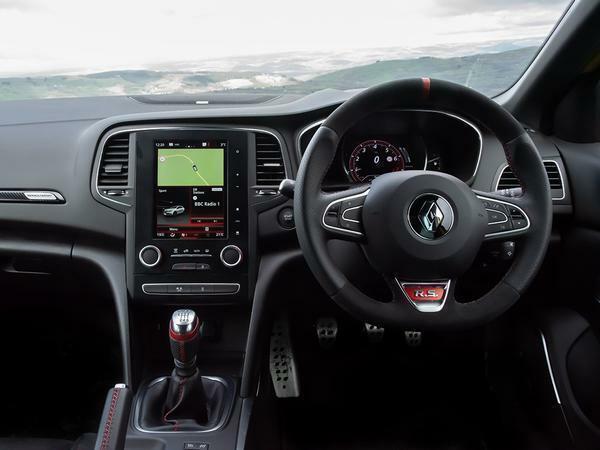 That said, being just quite a lot like a Golf GTI does lend the TCR a few advantages: even in the Sport mode of its optional DCC dampers, the ride is not as unyielding as in the Megane, and even at the end of its life the interior makes more sense. There's also a suspicion that, despite a marginal shortfall in power output, it might still be a little quicker than the quickest Megane. 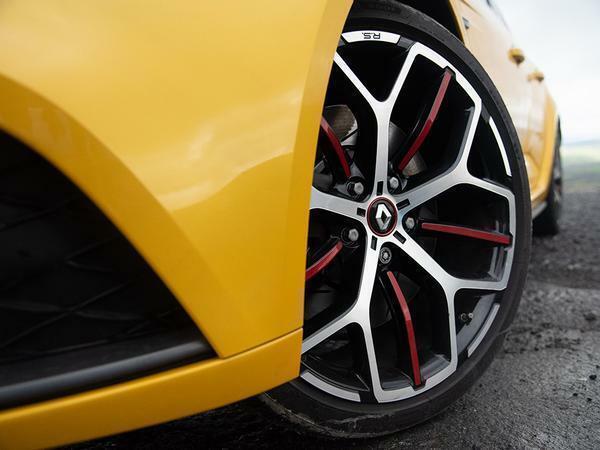 Perhaps that's the seven-speed DSG effect - but it feels livelier in-gear than the Trophy, and that makes it easier to live with, too. How to reach a definitive conclusion, then? 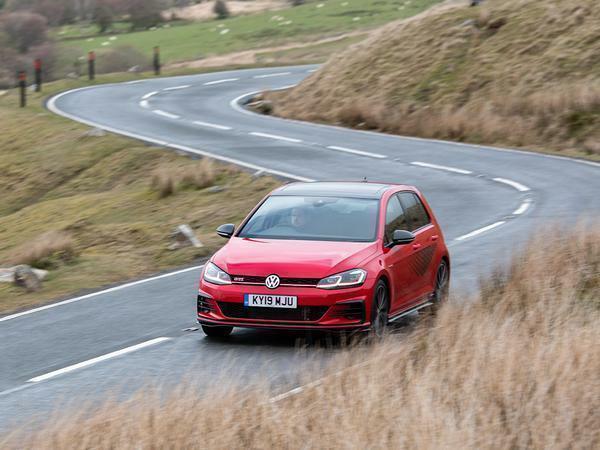 Any objective appraisal is likely to land on Volkswagen's side of the fence because the Golf is the more complete car, and therefore the one to recommend to 80 per cent of people who ask your opinion on 'buying a hot hatch' because it possesses that uncanny ability to just sort of do everything well. 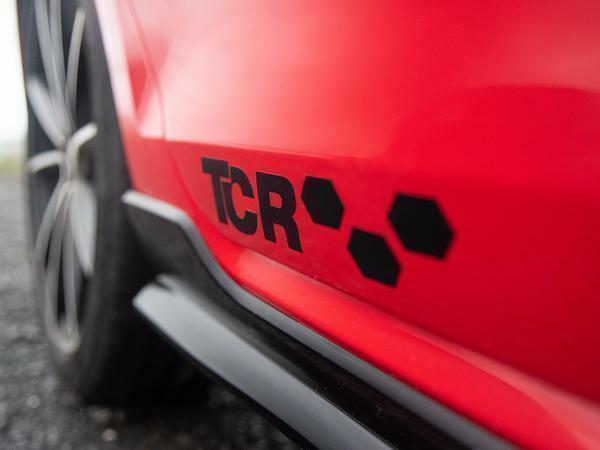 Anyone expecting a quasi-racer from the TCR badge will likely be disappointed. Anyone expecting a very good medium-fast car will not. But as enthusiasts - and representing the 20 per cent that rate thrill over contentment - the Megane takes it. There are flaws, of that there can be little doubt, but there's a greater level of intrigue, challenge and reward, too. A horses-for-courses verdict, yes - but smiles per miles is the only quota that really counts and the Trophy's count was higher. That it also produced ten times the furrowed brows of the TCR will mean that it is probably not destined for universal approval; although given the entertainment it provided in half a day - and the greater handling depth it continually hints at - it's the one we'd bank on falling in love with over time. Where's the prestige & pride in owning a French Renault? Where does the i30N sit when compared to these two?